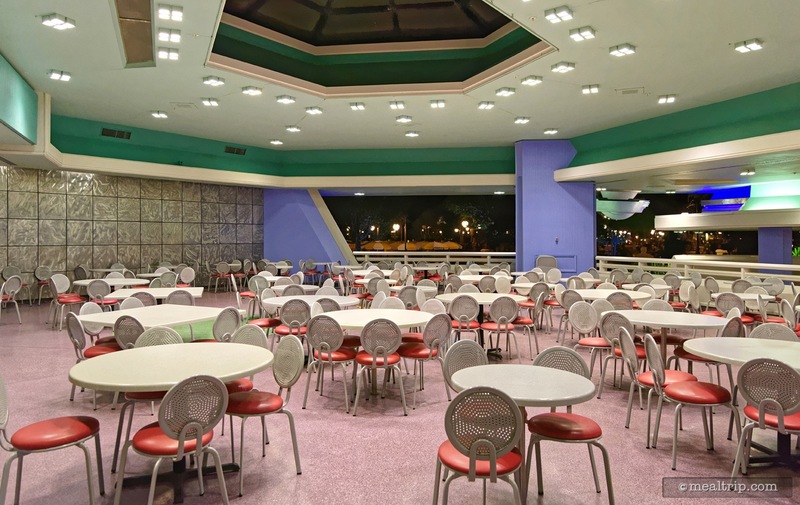 The Tomorrowland Terrace Restaurant is only opened seasonally, but offers ample covered seating and cool background music from several of the Tomorrowland attractions, past and present. When open, this counter service location offers some rather original entrees that can't easily be found at other counter service locations. A few standards, such as burgers and chicken nuggets are usually also available. 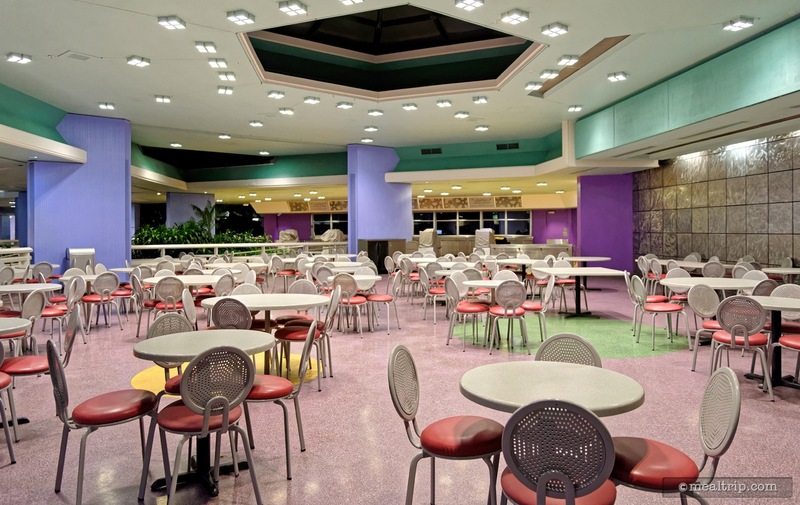 It's not every day you'll find the Tomorrowland Terrace Restaurant open. No, really.. it's one of those "peak" period places that's usually closed. In the summer however, the part-time counter service restaurant springs to life, and often serves up some of the more interesting fast-food options in the park. Hopefully you know where Tomorrowland Terrace is, because it's not really near anything. The Wishes Fireworks Dessert Party takes place on the Tomorrowland Terrace's lower seating level… and it seems more people are familiar with those dessert parties, than the restaurant. Basically, if you're walking down Main Street and take the first right (at the Plaza Ice Cream Parlor), keep walking until you find yourself under a concrete overhang… you're there! The menu does seem to change a bit every time the location opens and closes, and there's no guarantee when that's going to be. 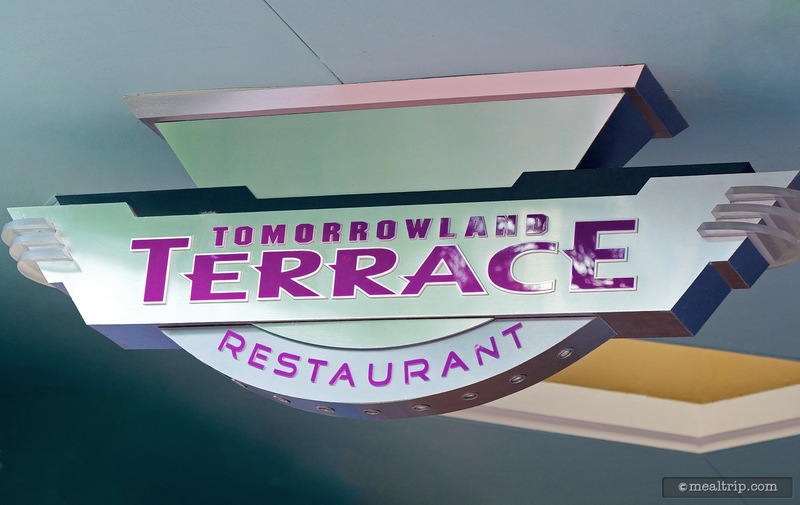 If you're walking by and the Tomorrowland Terrace is open and there's something cool on the menu that you want to try… now is the time, now is the best time (sorry, now the song is stuck in my head). There are always a few park standards on the menu... a cheese burger, a salad of some type and some chicken nuggets... but it's the unusual things that we're most interested in, because they've had to go through a taste-test battle just to work their way onto the menu. For the summer of 2016 (it seems), the new items are a Spicy Chicken Sandwich with Pepper Jack Cheese, a Pulled Pork Banh Mi Sandwich (Banh Mi actually refers to the bread, it's traditionally kind of a French baguette leftover from that country's Colonial period, but that's more than you wanted to know), and the sandwich that we're featuring here today… the Smoked Sausage Sandwich. If you're familiar with the Bratwurst that's served at Epcot's Sommerfest, the Sausage that's served in Tomorrowland Terrace's sandwich is about the same weight, but the bread they use here is (shockingly) similar to the bread used in the Banh Mi Sandwich… so the sausage seems to be dwarfed by the bread. There are an appropriate amount of Roasted Onions (not grilled) on top of the sausage but the real star here is the Grain Mustard. Whole Grain Mustard is fun stuff because you get a little textural "pop" from those seeds, and they are just really visually appealing! If you have never tried stone ground mustard or whole grain mustard, it's a little less vinegary than most "yellow mustards", but clearly you do get more of the actual mustard spice. Just as long as I'm tossing factoids in this review… did you know the bright "yellow" in most smooth mustards is actually food coloring? Another great reason to try whole grain or stone ground mustard! Back to our sandwich… it was a bit bread-heavy but I didn't really mind because there was so much of that beautiful mustard on there. The Smoked Sausage was a little more robust than the Bratwurst at Sommerfest, but don't let the word "smoked" turn you off if you're not into smoked meats. Not much of the smoked flavor made it past the onions and mustard. The roasted onions are a nice touch as well… they keep their "snap" a little longer than grilled onions, which can turn into a slimy mess if left around in a keep-warm tray too long. The Smoked Sausage Sandwich is served with "chips" (which is what's pictured in ours), but we saw just as many being served with french fries, so it seems you can substitute one for the other. (Disney fries are usually just so darn good… I'd probably go that route if I were to get this sandwich again.) Naturally, apple slices are also available. All in all, I'd actually choose this Smoked Sausage Sandwich over the Bratwurst from Epcot's Sommerfest… if I had to choose just one. 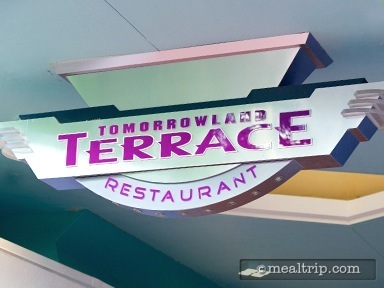 The fact that I can't get a beer at Tomorrowland Terrace… is a bit of a let down… because that would have made this a perfect lunch! 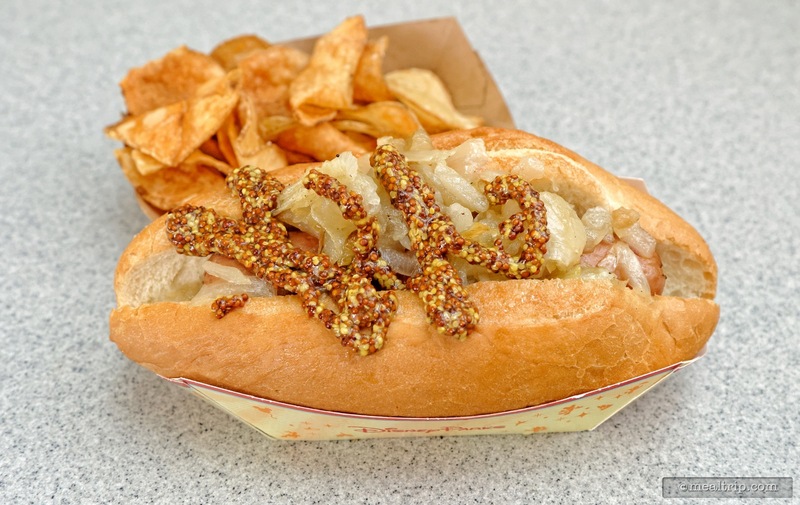 I just have a hard time getting over what Epcot's Bratwurst "used" to be (say six or seven years ago), and the "new" Bratwurst at Sommerfest is not all that it used to be. 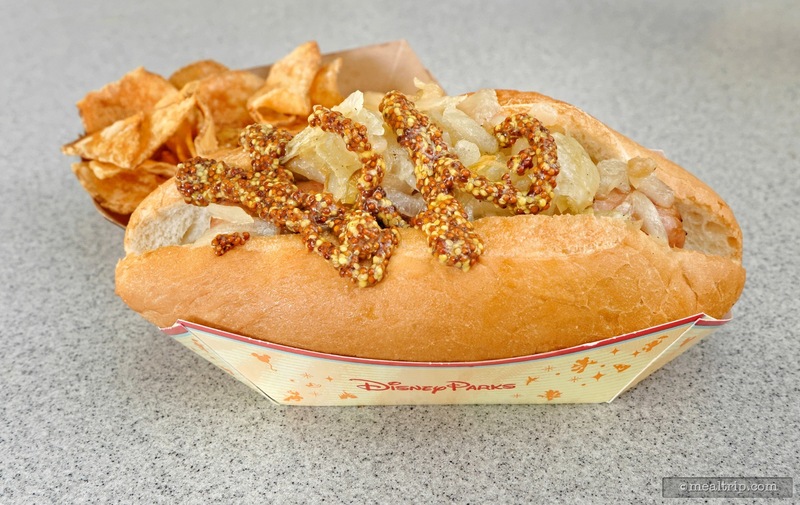 Here at Tomorrowland Terrace, you get the amazingly fun whole grain mustard which is a little more spice and peppery than the yellow stuff, which pairs perfectly with the sausage and onions. CLICK HERE to view all 4 images in our photo gallery.